Spanning eras and cultures from ancient Rome to medieval England to 1950’s Hollywood, Jennifer Wright’s It Ended Badly guides you through the worst of the worst in historically bad breakups. In the throes of heartbreak, Emperor Nero had just about everyone he ever loved-from his old tutor to most of his friends-put to death. Oscar Wilde’s lover, whom he went to jail for, abandoned him when faced with being cut off financially from his wealthy family and wrote several self-serving books denying the entire affair. And poor volatile Caroline Lamb sent Lord Byron one hell of a torch letter and enclosed a bloody lock of her own pubic hair. Your obsessive social media stalking of your ex isn’t looking so bad now, is it? With a wry wit and considerable empathy, Wright digs deep into the archives to bring these thirteen terrible breakups to life. She educates, entertains, and really puts your own bad breakup conduct into perspective. It Ended Badly is for anyone who’s ever loved and lost and maybe sent one too many ill-considered late-night emails to their ex, reminding us that no matter how badly we’ve behaved, no one is as bad as Henry VIII. Jennifer Wright had me laughing out loud with It Ended Badly: Thirteen of the Worst Breakups in History. The history buff in me wanted to read this one as soon as I saw the title. Some of the couples that Wright gives us the breakup dish on I had heard of, like Henry VIII and Anne Boleyn and Oscar Wilde with Lord Alfred Douglas. Other couples such as Nero and Poppaea, were among the ones I did not know of. Caroline Lamb and Lord Byron’s breakup story was my favorite. I was stunned, I couldn’t help but laugh at some of these people’s behavior and I had to Google them to see if it was true. Happy Monday everyone. I always find that Monday’s are better when there are books involved. 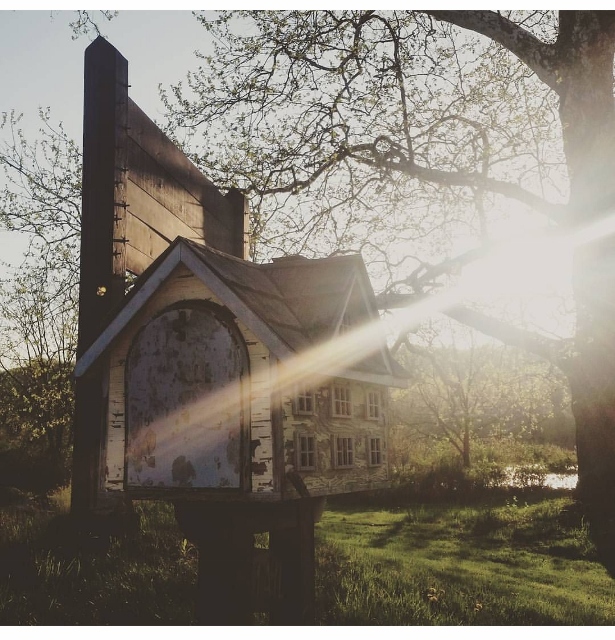 I took that mailbox photo above while out on a drive one weekend and I thought it would be perfect for a MM post. I purchased two books lately and one arrived for review. 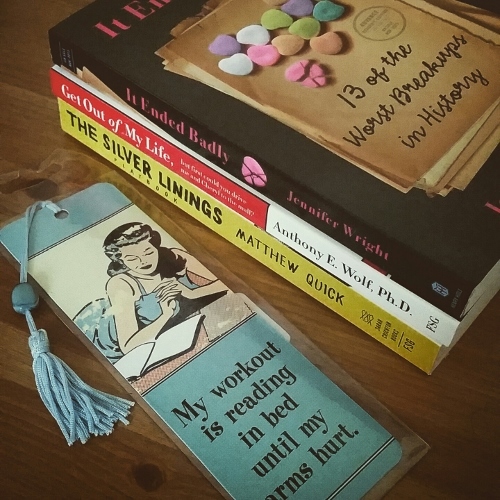 I also got a new bookmark that reads “My workout is reading in bed until my arms hurt.” I couldn’t resist it. It Ended Badly: Thirteen of the Worst Breakups in History by Jennifer Wright arrived via AmazonVine. I am halfway through this one, and have gotten some laughs out of it already. first line: Anna was a good wife, mostly. Author Jill Alexander Essbaum is a new to me author and I am glad I discovered her work. She is a poet which does not surprise me as Hausfrau reads like poetry at times, the narrative flows beautifully. At the heart of this emotional and sad story is Anna, a thirty-something married mother of three who is her own worst enemy in many ways. I read Hausfrau intermittently over the course of about two weeks. I could not sit and read for too long at a time. It was a somber book and Anna’s sadness just flows throughout these pages. first line: The street was quiet, empty of the noise of living people, with only the sound of a million leaves hissing in the strong breeze that intensified as it blew over Hampstead Heath in north-west London. Snatched in the dead of night from the safety of the family home. There’s no sign of forced entry, no sign of struggle, and no one heard or saw a thing. DI Sean Corrigan needs to find four-year-old George Bridgeman before abduction becomes murder. But his ability to see into dark minds, to think like those he hunts, has deserted him – just when he needs it most. As he investigates, another child vanishes — and still no trace. What kind of monster is Corrigan hunting? And will he work it out in time to save the children? I have to start my review by saying that The Toy Taker is a fast paced crime thriller that had me on the edge of my seat. I actually have The Keeper, which is the second in the series, but I did not realize it until I was already immersed in this one. As the book opens, we get inside the kidnappers head as he breaks into the home of an affluent couple in London and kidnaps four-year-old George Bridgeman while the family is asleep. His mother doesn’t realize her son is missing until the next morning. There is no sign of forced entry or of a struggle and police are stumped as to who entered and exited the house without leaving a trace. Just when Detective Corrigan thinks he has the person who did it in custody, another child is taken and Corrigan and his team find themselves at square one again with time running out. Appearing on random Tuesdays, Really Random Tuesday is a way to post odds and ends–announcements, musings, quotes, photos–any blogging and book-related things you can think of. I often announce my book giveaway winners in these posts….The lovely Suko hosts RRT. I know I always say this, but where does the time go? August is here so soon it seems. That means that September is just around the corner, and along with that all the back to school run around that comes along with that time of the year. I was on vacation for a few weeks which has been really nice. There is something to be said about not really sticking to the clock or to any schedule. While at the lake a few weeks ago, I could not get enough of the sky and clouds and took my Canon with me pretty much everywhere I went. The images below are all unedited, you can click on them to get a larger view if you’d like. Hubby is a good sport and woke up at 5:30am with me to take photos of the sun rising on the lake. 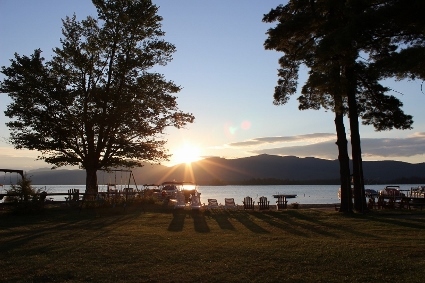 I would tan and read sitting in those Adirondack chairs.